There are many types of scales but the majority of blues and blues based rock is played with the minor and major pentatonic shapes (with a few variations such as the flat 5th or blue note). Pentatonic being a five note scale. This is the scale of A pentatonic minor with the root (A) on the 6th string. Here is the same scale with a change of position that will allow you to go higher up the neck i.e. “the extension box”. This is a different version of A minor pentatonic starting with the root on the 5th string. This is an octave higher than the previous one, as indicated by the 8va above the stave. And again the A Major pentatonic with extension box. This is the same scale starting with the root note on the 5th string, again the 8va indicating played one octave higher than written. If you compare them – A B C D E F G with A C D E G you can see that the pentatonic minor is an abbreviated version. 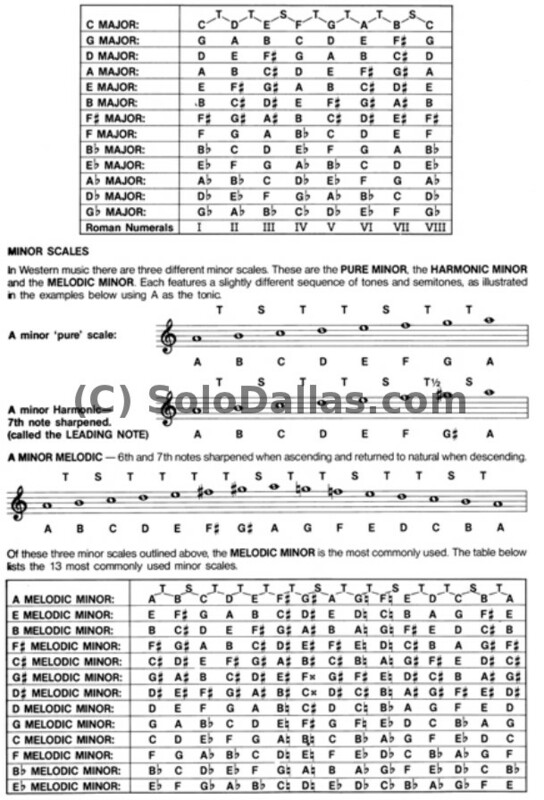 The Pentatonic minor scale has no 2nd and no 6th note. A Natural minor starting with the root on the 5th string. A B C# D E F# G#, in comparison with the pentatonic’s five A B C# E F#, so again it can be seen that the pentatonic is an abbreviated scale. The Pentatonic Major scale has no 4th and no 7th note. and A Major one octave higher with the root note on the 5th string. Essentially all of these scales are movable because they contain no open strings. All of the above examples are in the key of A minor or A Major because they start with the A note on either the 5th or 6th string. To change key simply move the scale to the root note required and as long as the same shape is played then the notes will be correct for the key. For example, if the above scale is moved down to the D note at the 5th fret of the fifth string and the same shape is played then the notes D E F# G A B C # D will be played , i.e. 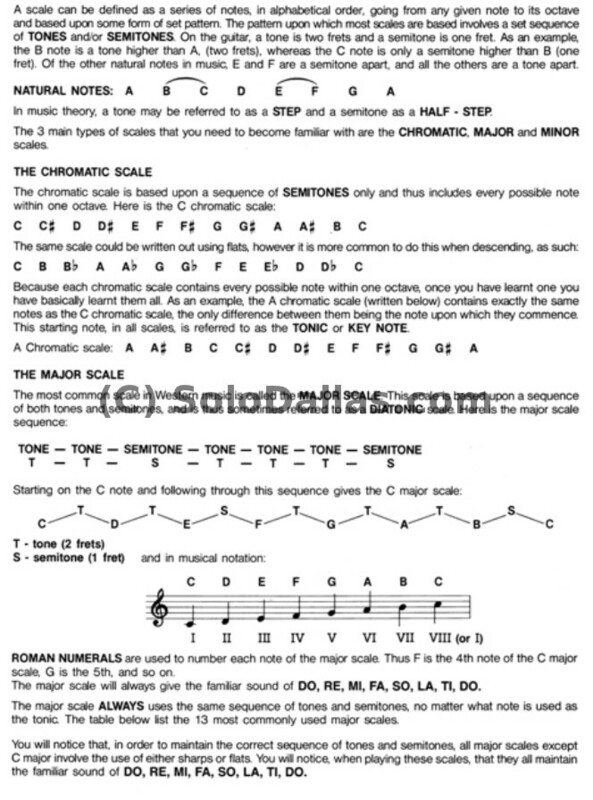 the D Major scale. If the very first example (A pentatonic minor with the root A on the 6th string) is moved up to say the 12th fret E note then the scale is E minor pentatonic E G A B D.
you will see that they have the same notes, just starting from a different position. Therefore these two scales are referred to as being relatives and this is true of every key. On the guitar to find a relative minor key simply move down (flatten) by three frets. C Major to A minor, A is three frets lower than C.
If there are any questions, don’t be afraid to ask. Failing that there is always SKYPE. I hope this will solve the ‘mystery’ of where to play on the fretboard for someone. I’m sorry I messed up on my comment below. Touch too much is not in G Major but in E minor. Same key signature though. Same with Let there be Rock. (At least I think Let there be Rock is E minor. I personally think it switches key signatures especially during Angus’ solos. It ends with a B chord so It could be in E minor since it is the 5th tone of the scale). I’m a little confused about AC/DC’s music theory. Lets say an AC/DC song is in the Key of A Major. I’ve noticed that these songs usually involve the G chord. Why? I think its because in the blues we have a Flat 7th. In the key of G is sharped and is the 7th tone of the scale so it makes sense that they use a G chord instead of a G# Chord. Anybody have any thoughts? Touch Too Much-Key of G Major. You are quite correct my friend, in the key of A major or indeed the major scale the 7th note is sharpened i.e G#. The big difference between major and minor is the 3rd (major)or flat 3rd (minor). When playing power chords the notes are 1st, 5th and 8th (octave of first) so the third is not heard. For A this would be A, E, A. This allows the minor pentatonic scale to be played over the major(ish) backing. i.e A C D E G and also allowing the chords A C D E G to be played. It does. Thank you. Looks like I need to brush up on my pentatonic scales. Nice. I love music theory. I’ve been studying it in school. I took a music appreciation class last year. We learned a lot of this stuff but some I have forgotten. haha. It really came in handy with my piano playing. Nice article, I understand some great musicians don’t care about the theory and they play with their soul instead, but I think theory is very interesting! Good summary, thanks for posting. Just understanding the pentatonic scales and how they map to the fretboard is probably the most important concept for a rock/blues beginner to grasp. Helped me a lot. I can only say same as Fil, i needed this to, i sat down some days and tried as much as i could understanding note symboles from several books i got, but no matter how much i read it wont do it, note symboles and signs is like bird foot prints to me, or chinese alfabeth(no offence if anyone here is from china ofcourse), it simply wont ”get in” for me, i’d rather use my ear and watching from the eyes how you can do it, i cant remember what all induvidual signs and symbols stands for either so it’s kinda pointless to me, but this was actually understandable, screw books this works much better! Could be made for me. Thanks!